The great French impressionist Claude Monet experimented extensively not only with light and shadow in his work but also with combinations and contrasts in color. In the Haystack Series, he painted the same scene repeatedly at different times of the day, almost in a scientific trial-and-error approach to observe how light and shadows fell upon and transformed the haystack, thus representing the ways in which the haystack absorbed and reflected the light. For him, grass was not just a single hue but instead comprising many tints and shades among the various blades of grass. 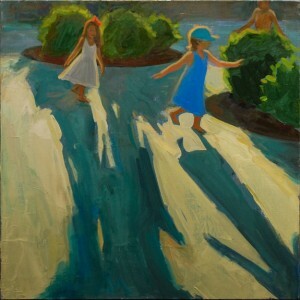 Shadowplay I, a 20×20 oil painting from a Utah Arts Festival scene, just completed for the exhibition by Karen Horne. 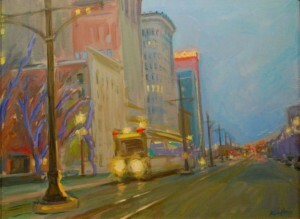 In the featured Utah Arts Festival exhibition, ‘Night and Day: Karen Horne paints the changing light of Salt Lake City,’ the artist captures her own unique set of visual mixing effects with colors, light and shadows in paintings of some of the city’s most familiar landmarks and community spaces, including the festival itself. Her renditions of Salt Lake City’s street life, executed in worlds of color, not only document how the city itself has grown and changed within the last 15 years but also how the object, location and subject of the painting only lasts for a temporary moment before it once again is changed, especially in different settings of light and shadow. 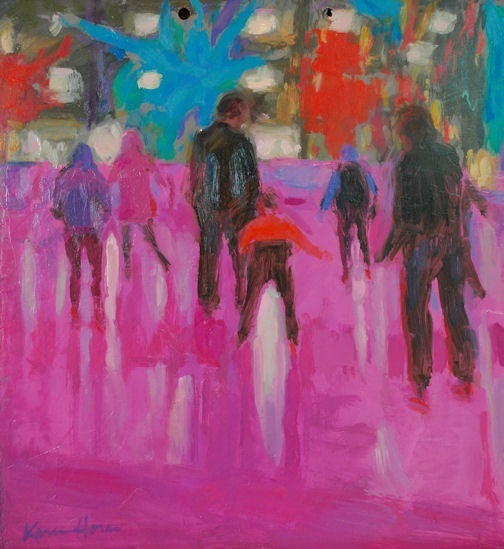 Gallivan Skaters, a 30×30 oil painting completed after the renovations were made at Gallivan Plaza in downtown Salt Lake City, by Karen Horne. The exhibition at Gallery at Library Square is now open through Aug. 1. Horne, who just last year received the Mayor’s Visual Artist Award at the festival, also will offer two workshops (June 28 and 29, 1-3 p.m. in the Library’s Special Collections Room adjacent to the Gallery) in which participants will learn how to develop atmospheric palettes of color for representing different times of the day. For more information about the workshops see here. 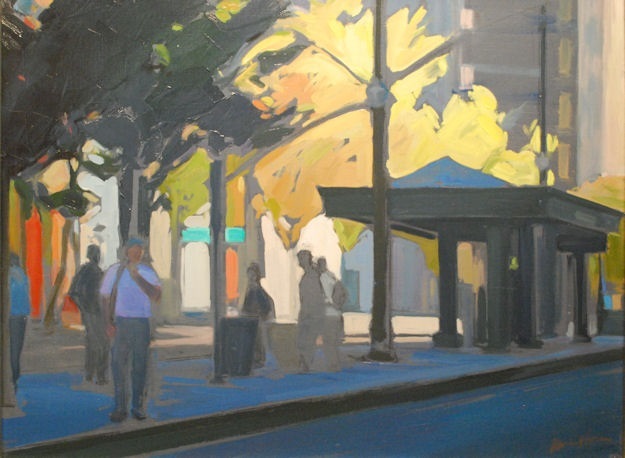 The paintings capture similar city scenes at different times of the day and season, such as Gallivan Plaza during a summer day and winter evening. The summer setting in warm and bright tones and hues shows visitors near a wading pool when the festival was held at the location. Meanwhile, the winter scene portrays a skater bathed in psychedelic light at the center’s ice rink. Another series chronicles the city’s Main Street near the TRAX light rail station. Reds and blacks infuse a rain scene, while an early twilight scene is bathed in soft purples and blues, and silhouettes in a third scene represent light-rail passengers waiting on the platform for a train. There is a triptych of Utah Arts Festival scenes showing activity in the late afternoon and early evening as well as a motley cluster of T-shirt clad festivalgoers. Another festival scene just completed in time for the exhibition is titled Shadowplay I, showing long shadows as girls twirl on the plaza. Visitors will see similar treatments of scenes including Abravanel Hall, the Tower Theatre in the 9th and 9th neighborhood, The Capitol Theatre and other downtown venues. 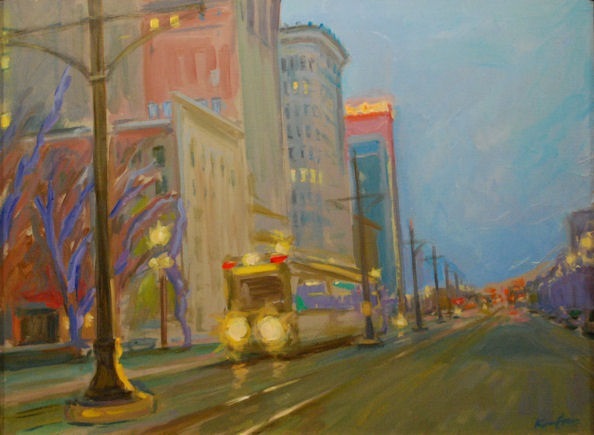 Heading Up Main, an 18×24 oil painting by Karen Horne. Horne, who was born in New York City and raised in California and Utah, has always been a fan of city street life. Her family has long roots in the Utah art scene, as her great-grandmother Alice Merrill Horne founded the Utah Arts Council in 1899 and organized numerous artists’ exhibitions. Her mother, Phyllis Horne, is well known for her landscape paintings. Horne earned college degrees at Yale University and at Indiana University before heading back to New York City where she worked on paintings of many scenes of urban and street activity, along with working at the famous Frick Collection. In 1996, she and her husband returned to Salt Lake City and seven years later they opened the Horne Fine Art Gallery just outside of downtown. 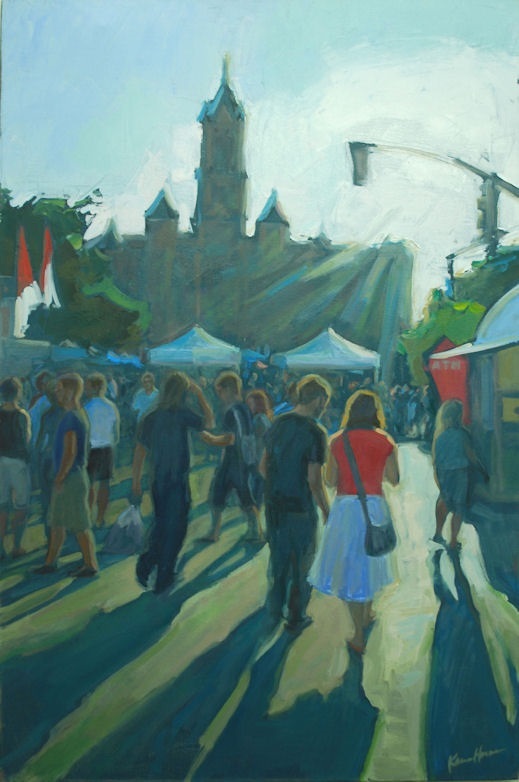 Silhouettes on TRAX, an 18×24 oil painting by Karen Horne. 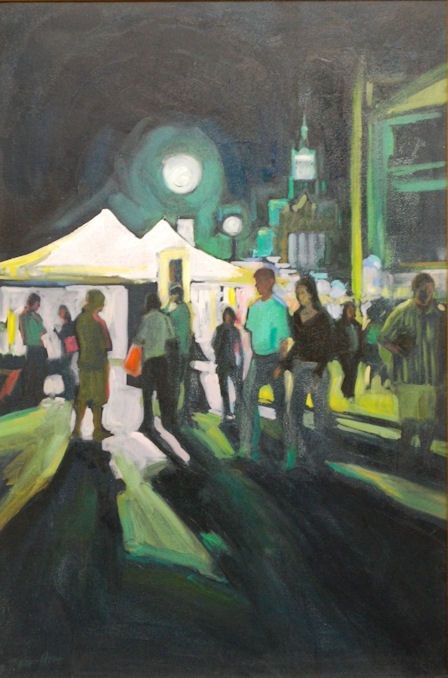 Evening at the Utah Arts Festival, a 36×24 oil painting by Karen Horne. 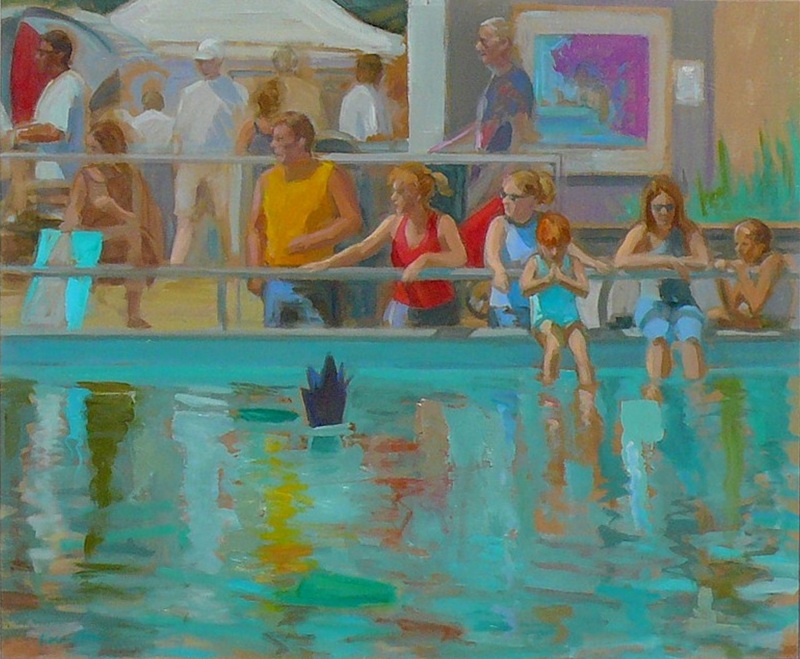 Rainbow of T-Shirts at the Utah Arts Festival, a 36×24, oil painting by Karen Horne. Her straightforwardly stated point is significant. Traditionally, an artist might work en plein aire for an urban street setting. Instead, Horne, whenever she is downtown at day or night–in any season of the year– or when she is attending a concert, ballet, or theater performance in downtown, she always has her camera handy, snapping numerous shots of images that she might use to portray a particular mood and emotion conveyed by the lighting, colors and shadows in a scene. She returns often to the same scene at different hours of the day and in different seasons, whether it is a bright, sunny hot day or a drizzly, grayish winter day where the precipitation is just beginning to mix out the inversion that plagues the region ever year. The series is also notable for how the downtown’s skyline is changing as new structures come into being, such as the new Jessie Eccles Quinney Ballet Centre going up next to The Capitol Theatre, and the new performing arts center that soon will be built on Main Street. Horne’s exhibition engages the visitor in a color guided tour of some of the city’s most familiar venues and, of course, the wonderful moods evoked in events such as the Utah Arts Festival. It is an artist’s love letter to the city. Horne’s work has been shown in galleries across the United States, from New York City to San Francisco and Sante Fe. Her work is in several numerous collections, including the State of Utah’s Springville Museum, Salt Lake County and corporate venues such as Hilton Hotel and American Express. For more information about Horne Fine Art, see here.